🎹 Best Digital Pianos Under $1000 - Roland FP30, Yamaha P125, Casio CGP700, Kawai ES110, and more. 🎹 UPDATED REVIEW: January 1, 2019 - Yamaha, Roland, Kawai, Casio, Suzuki, Korg, etc...which one is best and which one should you buy?! 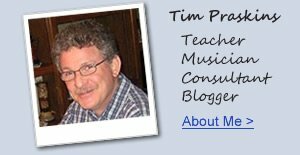 My name is Tim Praskins and I am a digital piano expert and have been teaching & playing on them for over 40 years (started teaching as a young teen:) and have taught 1000's of students during my extensive music career. I play acoustic concert grand pianos, digital pianos, and pro keyboards professionally (as well as play and teach guitar & organ) and do digital piano consultations for schools, churches, piano teachers, studios, and families all over the world to help you decide what piano might be best for you in your price range. There are some people out there who say they specialize in digital pianos or have had some experience on them, but that does not necessarily mean they know what they are talking about because most of them don't. 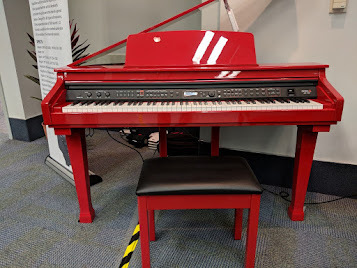 Although there are a few changes and/or additions in digital piano models for 2019, many of the digital pianos for 2018 are still current models in 2019 and when any new models or changes should come up I will be sure to review and post them on this blog so you can know more about them. Picking out a new digital piano can be a daunting task because there are so many brand, models, price ranges, and features. Rather than take your "best guess" and leave it to chance, do yourself a favor and contact me and I help you get through the maze of confusion so that you can make an informed decision on the new digital piano that would be the right one for your specific musical needs and budget. 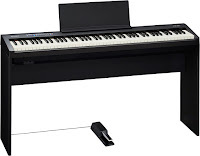 Yamaha currently offers 5 models of 88-key digital pianos models under $1000 including the P45 ($449US internet price), P125 ($599US - left pic), DGX660 at $799US, YDP103 at $899US internet discount price, and the YDPS34 at $999US internet discount price. I have reviewed all of the Yamaha models under $1000 with the exception of the P125, DGX660, and the YDPS34, so stay tuned for my reviews on them coming soon, although I have played those pianos many times and you can always ask me about them. I do recommend all of the Yamaha's mentioned here, and although the least expensive Yamaha P45 portable model is somewhat basic in what it can actually do, it's still a good beginner piano for those people who need to stay under $500 cost. 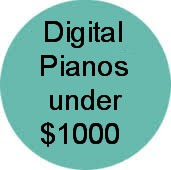 Many of the digital pianos that Yamaha produces sell for over $2000 whereas most of the digital pianos produced by Casio and Korg sell for under $2000. So when it comes to Yamaha, especially in a furniture cabinet style, you'll need to spend a bit more money in some cases if you want better quality key action and sound, but it can be worth it. It just depends on the piano itself and what you actually get for the money. Korg offers 4 models under $1000US including the SP170S which is now replaced by the newer B1 ($499US), The next model is the SP280 ($699US), the new LP180 ($699 internet price), and the LP380 ($1099 internet price, just slightly above the $1000 price range). I like the LP380 very much which has their upgraded key action although like the key actions, dynamic range, and velocity sound response of the lower priced NH key action in the Korg B1, SP280, and LP180 as compared to other brands in this price range (although the regular piano sound itself is good). These are the most important aspects in picking out digital pianos. So the overall best piano options in the lower price range under $1000 are either the newer Yamaha, Casio, and Kawai pianos or the Korg LP380 in my opinion. 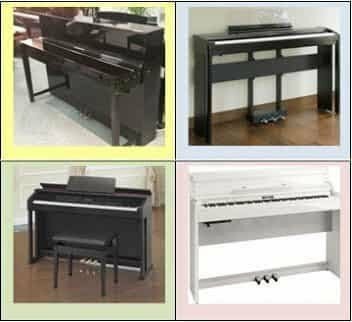 Some of the Yamaha & Casio pianos I recommend are portable so you would need to purchase an optional furniture style stand (or cheaper metal stand), pedals, and bench to make it more complete. But even that expense should not put you over (or much over) $1000 if that's where you need to be. 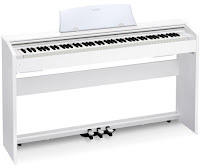 Many of the off-brand digital pianos will create and foster bad playing habits in piano students because of the deficiencies in these pianos concerning their key actions, piano sound response, pedaling, and/or other aspects of piano playing. Nice attractive exterior cabinets in digital pianos do not always mean those digital pianos are good for playing music correctly...even at minimum standards. Just because a digital piano is attractive on the outside does not it good on the inside with regard to key action, sound, realism, electronics, reliability, etc. In fact, some of the more basic looking pianos for less money in the good recommended brands do a much better job than some of the more attractive deluxe furniture style cabinet brands in the off-brands such as Artesia (as I already mentioned) available at Costco US. You should never judge a piano by its appearance or even the hyped up sales & marketing info you get from a manufacturer. You just should not believe everything you read from a manufacturer because their goal is to sell you their piano so they often times exaggerate their claims of how good their pianos are...and I have seen this many times. So be careful. Of the five brands mentioned in the lower price range here, I believe Casio overall offers a noticeably better piano playing key action experience than Yamaha or Korg, although Yamaha has some very nice models at $1500US and above. 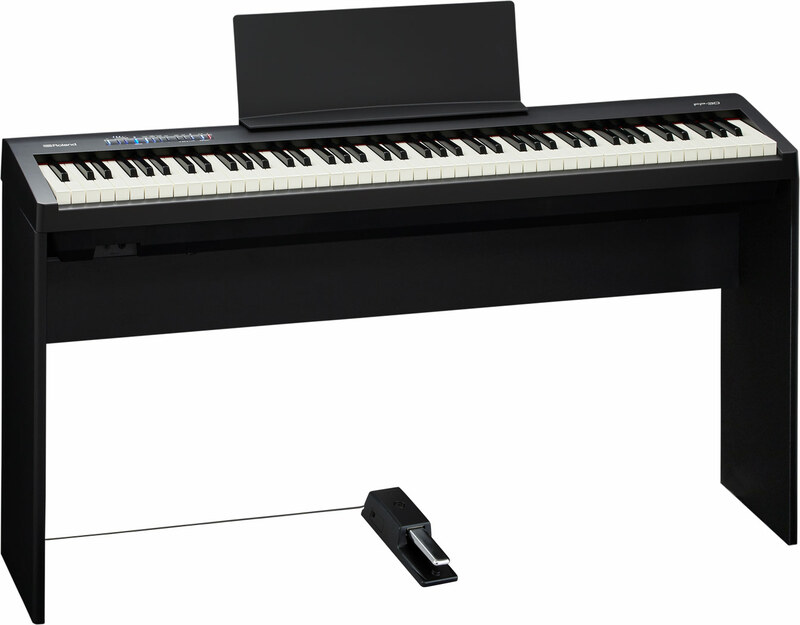 The lower priced Yamaha P125 & DGX660 are also quite fun to play and certainly worth looking at and I do like them, but the new Kawai ES110 portable piano key action and piano sound is definitely superior to Roland, Yamaha, Korg, and Kurzweil portable pianos under $900 in my opinion. But ultimately, all of these models I mentioned here would be fine, although everyone I talk to pretty much wants the closest reproduction a regular piano as they can get for the least amount of money. For many beginner or recreational piano players and students, it can be difficult for them to determine which piano actually does do the better job in terms of the piano touch, tone, and pedaling realism because sound and touch are normally a subjective thing. Also, to make matters more difficult, it's not likely you'll find all of these pianos in one place at one time to try them out, or even find some of them locally at all. One of the best things to do in my opinion is to your research and then listen to an experienced expert like myself and then you'll get a better idea of what might work best for you and your family. Of all the digital pianos out there under $1000 I would say overall my favorite cabinet piano under $1000US right now is the Casio Privia PX870 at $999US internet discount price (left pic). 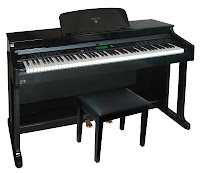 This piano really surprised me for its low price after I played it because it has a nicely designed compact cabinet with the 3 built-in full function pedals and slide out key cover, and it had a pretty big sounding acoustic piano tone with a wide dynamic range. The key action has a 3-sensor key technology not normally found in less expensive cabinet digital pianos until you get above $1200 in other brands. 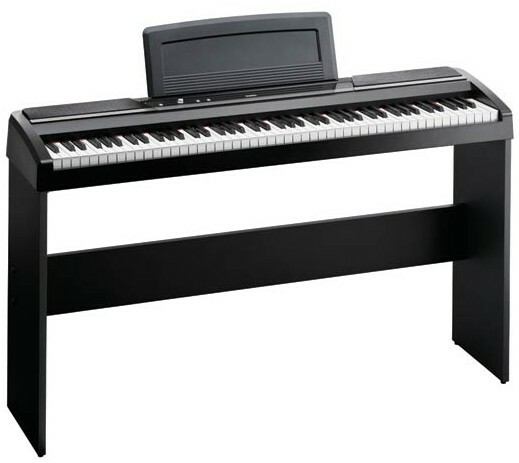 The Casio PX870 also has the synthetic ivory & ebony keys (normally found on pianos in higher price ranges), 256-note polyphony piano memory (which is a lot), half-damper recognition (a good feature for piano students and players), fairly realistic acoustic piano hammer (graded piano weighted) key action, direct USB output for instant connectivity with laptop and iPad (go to the following link to learn more about iPad apps: iPad Apps and learning piano), and some useful built-in educational features. There are some people who equate the name Casio and its lower prices with lower quality, and it is true that sometimes lower price can mean lower quality (especially in key action & piano sound) such as what I have experienced with the Williams, Artesia, and Suzuki digital pianos. When it comes to recognizable & respected brand names in the acoustic piano world, Yamaha & Kawai pianos have always been known to be in that recognized group and many pianists, piano teachers, churches, schools, and families do own Yamaha & Kawai acoustic pianos. But some competitive Yamaha & Kawai digital pianos right now cost more money than the new Casio pianos depending on the model. Casio actually is a respected Japanese technology company which has been in business approx 60 years (that's a very long time) having produced millions of electronic products including keyboards & digital pianos for about 30 years. Casio is not necessarily my favorite digital piano company because I don't actually have a favorite. Kawai, Roland, Yamaha, & Casio are all my favorites but each one does better in different price ranges and it also depends on your musical goals and budget as to which brand and model will be best for you. IMPORTANT PUBLIC NOTICE ABOUT MY REVIEWS - Just so you know, there is no precise or impartial digital piano rating system (like stars, check marks, numbers, etc) as some people on the internet would have you believe...and that's why I don't do it. There are just too many variables. In fact there are some so-called "reviewers" out there who have no idea of what they are talking about, they say things that are just not true at all, they rate cheap keyboards along side of digital pianos which is ridiculous (keyboards are not digital pianos), and what they report is only so they can link you to an Amazon site to make THEM money if you buy something. These "reviewers" are as impartial as bees are to honey...in other words they will say things that gets you to buy a "recommended" piano off their Amazon web site links. If you see something like that then run away from those people as they are not there to help you, regardless of what they say. In fact, I have noticed that many of these "fake review sites" steal my content and then post a version of it on their web sites. I know this because they copy some of my blog review sentences would they would otherwise NEVER say and they could not have been able to test out many of the unique pianos that I have and then come up with the conclusions they state in their so-called reviews. It is true that imitation or downright coping is the sincerest form of flattery but unfortunately on those sites it is done solely to make money off of you without regard to what is actually true, and that does bother me! 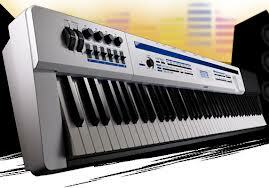 I want to buy a piano..I have impressed in second one(Casio CDP220R).. I will definitely but this. Thank you for your price list information. I'd love to see a post covering your recommended iPad apps. Thank you very much for your recommendations, this will greatly help me pick a piano for my son. I am looking for an electric piano for our vocal music major son to take with him to college. He would like one with a full size keyboard. I am unsure what kind to purchase, whether it should be digital (and the benefits of digital capabilities), and whether it should have recording capabilities. I also would not like it to break the bank. Do you have any advise? Wow, what a great blog! Thank you. It's people like you that make purchasing a more balanced experienced. I had a music store tell me they only sold yamaha digital piano's because they were the best and no other brand came even close. I'm buying the Casio Privia PX750 for my 10 year old who has been asking to play for 1 year. Again, many thanks. Life-saver of a blog. Thank you! We are a home schooling family with six children. We have had two yamaha dgx 535 models. Both were GREAT for about seven months, and then became so clicky, i couldn't stand it. (I have played piano since the age of 4, although now am too busy to take anything seriously.) With several hours of playing time on the average day, we definitely need a work-horse. Trying a Casio once we collect enough pennies. Do you recommend the Casio Privia PX-735CB? Is this similar to the Privia PX750? Trying to choose between this and th Yamaha P105 or the Yamaha DGX750. What would recommend for a prior piano player? I have played until 'grade 8 piano' about 8 years ago. I don't have the money to buy an acoustic piano yet but will buy on in the future so what would to recommend in terms of digital piano that will feel like an acoustic piano (weighted/hammered keys). Thanks! I would recommend a Casio PX850, Yamaha YDP162, or Kawai CE220. This site is great. Since the Casio Privia PX780 is not out yet, how do you recommend getting a feel for this piano? I am getting this for myself (I actually have an upright piano, but with 2 little kids, I have no time to play during the day. And then I can't play at night or I'll wake them up). I want to wear headphones and be able to play something that feels like a real piano, and I like what you say about the Casio. You can play any new Casio Privia PX model including the portable versions and they will all have the same key action weight and movement. If you like one model then you will like them all:). If you have more questions on features and prices, please email me direct and I can give you more detail. I am a beginner in playing piano and I just purchased the Casio CDP 220R. What is your thoughts on this Digital Piano ? What differences exists between px135 and px150? What do you recommand me: px 135 or p 105? Thank you! I own a Roland E09 right now. I bought it with the intention, that I would never master the piano. Well after 1 1/2 years, my teacher is now telling me I need to get a full 88 key piano. I was going to go portable again because of heart issues that I have, but might get an upright. Please recomend a good model for me. Looking fro a good piano sound, and some good organ sounds also. Any help would be appreciated. I had to give up my trumpet after 50 years of playing, so I took up the piano. What would u recommend for a 9 years old beginner. 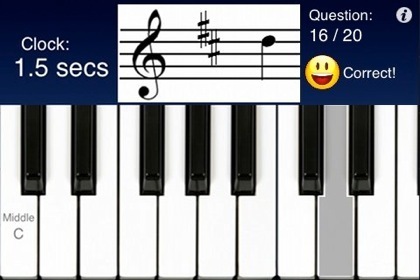 I would like the digital piano with weighted keys and suitable to play on up to ABRSM grade 5 or 6. Thanks! In my opinion, the new Casio key action is noticeably more realistic in terms of acoustic key action as well as dynamic range for piano sound. Although the Yamaha is a very nice instrument, there are definite differences which are evident. I wish your family musical success! I'm a beginner and just started my piano lessons in recent month.I'm planning to buy a yamaha Dgx 230 for practice. I learning piano just as a hobby. Do you think yamaha Dgx 230 suits my need? Thanks for your opinion. That keyboard would be fine for now but it does not have the proper weighted piano keys. So as you get better you'll need to move up to a digital piano that has more realistic key action movement so you can play piano in a better way. Great site here thanks. Great to see you at 2013 Winter NAMM..
hi, I'm from Singapore and considering between casio PX 735 and AP220. I know both models have similar specs. in terms of sound quality, which one is better? I tested both models recently and it seems PX735 has brighter volume. the AP220 sounds softer. is this right? I'm an amateur classical pianist and have been playing for 20 years now. I play Chopin etudes, ballades, etc. just to give you an idea about my level. I own an acoustic piano but since I live in an apartment, I want a digital piano to practice my scales, arpeggios and heavy repetitive passages. I can buy used and am looking for something < $500. Have any recommendations? Remember, this is only for basic scales, arpeggios and for really loud passages that need to be practised hundreds of times.. Thanks in advance for your valuable advice!! We are considering one of the following Yamaha DGX-640 & Casio CDP-220R. It is for home use and mainly for the family to learn how to play, so the main thing is ease of use and the teaching programme. Sound, clarity etc is not important. The reason for these two is that I have been advised to go for 88 keys & weighed keys. If you have anything better to recommend I would appreciate that to. Hi. I have the same question. What did you find out between these two models? Thank you. I read your comments and found it very useful because I don't know anything about piano. I agree with you on the Korg and Casio, but I wasn't to fond of the Yamaha. Also, the Kawai mp6 is a great choice if you are looking to spend a little extra. Thanks for the great information. We're buying a piano for our kids (5 and 8), who are just beginning piano lessons. Would you recommend the Casio PX780 or the Yamaha P-105. When purchasing, pedals, a cabinet, and bench, they come out to about the same price. I've just started piano lessons this week. Currently I have a CTK-230 which is a very old keyboard purchased for me when I was 13 however we live in a small town so it was hard for me to find a teacher. Now am 22 and finally decided to start learning piano. My teacher has a baby grand yamaha. I really loved the wooden keys of the piano but can't afford a grand now. I don't really care about the extra sounds and features they add, I just want a realistic piano sound and feel. Should I go with the yamaha brand CLP series or the Kawai CE220? I want something to last me to grade 8 if its possible. Tim, this is all great, thanks. My issue is I have a Roland KR-3500 21 years old, and a board is bad. I want to replace the unit. I don't want a step down since I have digital sampling and weighted keys, etc., and I like the yamahas, though they are overpriced. Does the Casio 850 have accompaniment? if not, what do you suggest as your pick equivalent to the KR-3500 that is $1000-$2000, if any? Any help is appreciated. I have been playing the piano for some years now and I tested the majority of the digital pianos that you recommend. What I can say is that you're right about your suggestions. I particularly enjoyed playing the Privia line from Casio. I would add to your list of best digital pianos the Roland RD300NX which is a great musical instrument along those recommended in the article above. Thanks for your comments. The Roland RD300NX is a nice instrument, however it is well above $1000 internet discount price and it also has a key action that I am not very fond of...the Roland ivory feel-G action. Roland also has an ivory feel-S action and also PHAIII action which I do like very much, but I don't enjoy playing the G action as compared to any of the other brands in that price range. I have detailed my thoughts on that G key action in my review of the Roland RP301 & 301R which use the same key action. Great article. I found useful information and can say that it helped me in the choosing process. What are your thoughts about a Yamaha CLP430? The CLP430 is over $2000 selling price. I have done an extensive review of the Yamaha CLP pianos (incl the CLP430) which you can find on this blog. Look on the upper right side of the blog page and you'll see a large panel link to the Yamaha piano review. I see that you like the Kawai ES100 key action then the Roland F20, however, do you think the F-20 key action is "acceptable"? My impression is that the sound of the F-20 is better, however this is through youtube. Could you do a comparative description of the sound of these 2 piano? Thank you. - Are all the 3 models above identical in their graded hammer key action? - Does the 850 have any noticeably enhancements in comparison to the 780, apart from its speakers, cabinet design and 256bit polyphony memory? All Casio models have the identical key action. GREAT blog! This post is exactly what I've been looking for! Thanks for sharing your expertise! I'm curious, what are your thoughts on buying used digital pianos? Our budget is around the $500-$600ish range, but that would include a stand, bench, pedal, etc. So we are considering maybe getting a used Yamaha p95 or older Casio Privia. Obviously they are not quite as good as the newer models, and the condition would be a case-by-case thing depending on the seller, but I was just wondering if you have a strong opinion one way or the other of how these keyboards tend to hold up over time, or if buying an older used model is a poor decision or not. Tim, first thank you for your knowledge of these pianos and sharing it with us. I'm a person of 62, and has never learned the piano, but would like/interested to try my hand at it. Beginner all the way. Use to have a Casio electronic piano (not 88 keys) and for some reason just wasn't interested in it at the time and gave it to my grandson. But now, could be the oldness coming on, would like to try it once again. Any suggestion which one to purchase? My funds are limited. Thank you in advance. Tim, thanks for all this info, although I doubt between the Roland F120 and the Yamaha YDP-S51, just because of the space that they take, what can you recommend me as being best of these two?? I'd just like the kids to exercise their fingers and get used to the weighted keys (hopefully we can afford a new acoustic piano in the future- there's nothing like acoustics in music playing, whatever the instrument!) and train their ears to hearing the correct notes. I like it when I find all the information I need in one place. 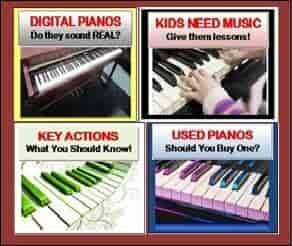 This article was very useful and it really helped me sort out what meets my needs concerning digital pianos. Thank you for your comprehensive reviews. I am looking to buy a digital piano for my 5 year-old daughter and based on your reviews I am trying to decide between the Kawai ES100 and the Casio PX780. Which one has a better sound and feel? Which one takes up less space? Which one is better suited for a 5 year-old beginner piano player/student? Can the ES100 be modified to allow it to be attacked to an iPad or iPod? After reading your reviews of digital pianos, I narrowed down my choices to the Kawai CE220 and the Kawai CS4. However a local store is trying to sell me a Symphony DL 800a, which is roughly the same price. I never heard of the Symphony piano before and was wondering if you can give me any advice. Thank you. The Symphony digital piano brand is really not a piano company and I do not recommend that brand. It is a private label brand made by a Chinese manufacturer who produces lower quality digital pianos for piano dealers all over the world. Although these pianos may look good on the outside they are normally NOT good on the inside. I have played virtually all name brand and no-name brand Chinese made digital pianos and most no-name brands like Symphony are terrible pianos in terms of piano key action, piano sound, dynamics, volume response, and reliability. Piano dealers like to sell the no-name brands like Symphony because they make substantially more money on their "house brands" like Symphony than on the name brands. Do yourself a big favor and stick with the name brands like Roland, Kawai, Yamaha, Casio, and a couple of others...you'll be glad you did! Please email me and I would be happy to share detailed info with you on the Kawai CS4, CE220, and other models and brands. Then you'll be more prepared to make a good purchase. Tim, thank goodness that I read through your reviews, thank you. A quick one if you have a moment - the quality of the switches & buttons on the Casio PX350? I have a Juno D and many have packed up, thus I ask. I have tried the Yamaha DGX 650 and the Roland F20 and I can say that they are both very solid digital pianos. I would give the slight edge to the Roland as you are able to plug in your headphones and work with various types of newer piano software. I'm not sure so much about the Yamaha when it comes to plugging it into your PC. i have just read your digital piano review and it was very helpful. I have one question. Which model would you recommend me for playing a background piano music in hotel restaurant or bar? I play twice a week and I use YamahaCP33 with pair of Electrovoice ZLX12 speakers. I would like to buy nice looking compact cabinet (easy to transport in van car) digital piano with good acoustic sound for this purpose and I do not want to use additional speakers. Is there any suitable model under 2000? would consider 700 dollars for a 2 years old Roland F120 (rarely used) a good deal ? 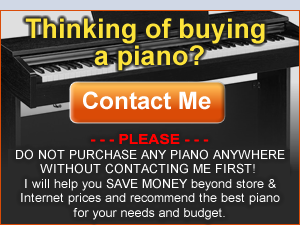 I don't give advice for used pianos or their prices. Without a factory warranty, buying any used piano is a risk and therefore price is relative. I do not like the key action or piano sound on that model so I would not recommend it for those reasons. I would instead look at the a new Yamaha DGX650, Casio PX750, or Casio PX350, all of which are in that price range. hello Tim i know nothing about pianos, i am going to start with my piano lessons sooon so i will need an piano (probably digital). My budget is about 1000 euro. What i want from my piano is a best sound i can get( natural and realistic like a grand piano) and the feeling of keys (like grand piano). I dont care about trinkets... So i want a digital piano closest to grand piano in terms of sound and touch. I am going to orient to classical music. I dont know if my previous post was accepted, so I will post again. I am an experienced piano player, I used to have a Upright piano in my dad's house where I learnt to play. I currently own a Roland Juno Di, which I use to play my midi files from the times we had a Tropical music band. Which will be your best choice in the 700-1000 range that will give the best Sound/action combination (in that order). I really don't know how my Roland Juno Di piano sound compare to the ones in your selection. Thanks for your contribution, your comprehensive reviews are really helpful. for piano sound, key action, and piano pedaling under $1000 for a portable digital piano, the Kawai ES100 would be best. For lots of good (not great) instrument sounds and a good key action under $1000 for a portable digital piano, either the Casio PX350 or Yamaha DGX650. Thanks for your replay. Since I already have the Roland with plenty of very decent sounds and features, then the Kawai seems to be the one. I just need to find a place where I can play it before I buy it to be 100% sure that's the one for me. 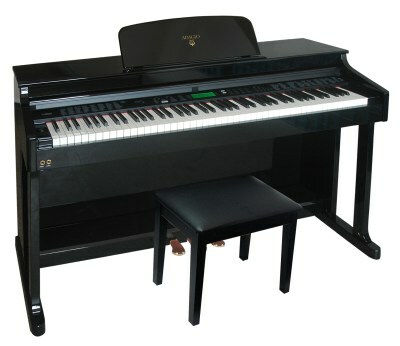 The PX735 is a older model digital piano that was part of the "30" series of Casio pianos including PX130/135, PX330, PX730/735, PX830, etc. The PX735 was not available in the US so I did not review it but it would have pretty much the same specifications as the PX130 (except it's in a small furniture cabinet and has 2 more sounds) which I did review. It was a pretty good piano although the the new model replacement for it, (called the PX750) is a much better piano. Hi, Tim. Great work on your blog! I wonder if you've had any experience with Orange digital pianos. I've been considering their higher end i8 model. Any thoughts? The Orange piano "company" likely buys their pianos from a South Korean digital piano manufacturer called "Dynatone." The i8 is probably just a stock piano from Dynatone and the owners of the Orange company have a company name they made up which is Orange and they label that name on the Dynatone pianos. In fact, Dynatone has made that same piano with the same cabinet for other companies or dealers in various countries. The "Broadway" digital piano is an example of something like that (it is sold in the UK) and has the identical cabinet. I have played a variety of Dynatone digital pianos over the years and although they seem to try hard to make a good digital piano, they just don't. Poor key action feel & response, disappointing piano sound realism, cheap pedaling functions, and old electronics including 64 note polyphony. A good new digital piano should have a much better product, and the Orange company appears to fall far short. Adding to all that, if there was ever a repair needed on that piano and a local tech could not be found to service it and get parts (which could be likely) you would have to pack up the piano and ship it back to the dealer you bought it from. You would be responsible for all costs and liability during that process. The piano warranty time is only 1 year which is 1/3 of the standard 3 year warranties from the name brands. I would recommend you stay away from the "Orange pianos" and their offshoot (Dynatone) brands and stick with the name brands because you get what you pay for. Good advice. I had my suspicions about this brand. The sad thing is that my local piano store, which I've trusted for years, has switched to this brand exclusively for their digital selection. unfortunately some music/piano stores sell "exclusive" product because it makes them more profit than name brands do. That's the hard truth in many cases. Tim, thank you. I am looking to play and sing at a restaurant...dinner music and wonder if the PX750/850 is portable enough? Thanks for all the helpful information. I would like your opinion on the best option between the Casio PX150, Yamaha P105, or the Kawai es100. The Casio and Yamaha are more in my desired price range but I want to get a good keyboard. Your opinion would be greatly appreciated. I have played the Yam P -105 for the past 18 months at least twice a week. Play for church, Senior Cntrs and dances. It always performs and feels and sounds wonderful. Tim Praskins opinion is what I have relied on a few times over the past nearly 30 yrz! Roland F-130 is under 1000€ in Europe. Would it be your best call or would you stay with the Casio Px-850? He will be moving around for various post graduate education and I want to get him a digital piano. I am torn between the Casio Previa px-150 and the Yamaha P 105. Both are in the same price range (my max) and as much as I would like to get the PX-350 or Yamaha DGX 650, there are not a possibility. I would also probably get the "cabinet" type stand so that he has 3 pedals as on an acoustic piano. Any insights to help me decide? The Casio would have the better more realistic key action which is the most important fundamental item to be concerned about in a digital piano. But both pianos have adequate piano sound although certainly not perfect in that way. They are, after all, low priced portable pianos. Hi Tim: I'd like to know if the CE220 has musical accompaniment. A friend bought one and it doesn't seem to have it. Thanks. It doesn't seem to have it because it doesn't have it:). The CE220 has drum rhythm patterns built in for a variety of musical styles (Jazz, Rock, Latin, etc), but it does not have auto arrangement accompaniments with musical instruments playing along in the background as you play. How would you compare between Kawai ES100 and Casio PX780, both of which you seem to greatly recommend? Which one is closer to a good acoustic piano? I myself have been playing guitar since I was 13 (I'm 59 now) and have just taken up playing the piano over the last 9 months. I can say from a first hand point of view that Tim is right on the money saying that it is never too late to start playing. I put it off for years and am glad that I finally jumped onboard. What do you think about korg pro lp 380? 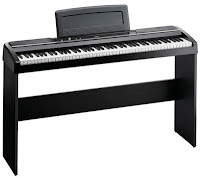 Hi Tim, I´m a complete "noob" regarding Digital Pianos and i was looking for first DP to start taking lessons and came across a good deal on the Casio Privia PX A-100 which I believe its similar to PX-150. As from a complete begginer point of view, would you consider this a good purchase? Thank you. Hi Mr. Praskins, please tell me, the best action between Kawai AHA-IV and Roland Ivory Feel S...is? Thanks. 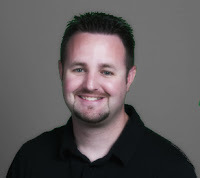 Hello Mr. Praskins, your reviews have been extremely helpful, I really appreciate the help. When do you expect to have a review out on the new Casio CGP-700. I'm trying to decide between the CGP-700 or the PX-860. I'm not sure if the new features on touch screen and the improved speaker system are worth going with it. Please advise. Thanks! The PX860 is for someone who wants to primarily play piano. The PX860 has a noticeably upgraded piano sound over the CGP700. If you wioll want to concentrate on playing piano in a more traditional way and getting the best piano sound possible in the lower price range, then the PX860 is definitely the best choice for that. I will have my CGP700 review completed and up by approx August 20th. Thanks for the reply. I went to guitar center to try it out, and I would have to agree. They just started getting the CGP-700's in stock. The PX860 definitely has a better piano sound, but the CGP-700 did have a lot of great features and the color screen made things really easy to navigate. The action seemed to feel a little better on the CGP-700 too, I'm not quite sure why, as they say they are the same action, but it felt a little lighter and really really good. Maybe because it was brand new, but it definitely seemed different. The ivory/ebony texture was a little different too. I think the PX-860 looks much better though, like a classy piece of furniture, whereas the CGP-700 looks more like a toy. The sound was loud and clear on the CGP-700, but sounded more like a PA system that a piano. I'm still torn because I really like the action on the CGP-700, but I think I'm leaning towards the PX860 as I am more looking for piano. I look forward to your review, thanks again! I posted a while back but my needs have changed. I sold my Yamaha acoustic piano (P22) which I loved. I am downsizing and moving into an apartment with thin walls. I'm looking to buy a digital/stage piano that I plan to use primarily for advanced classical music practice with occasional stage performance. My budget is $3000. Do you have any suggestions or offers for me? If so, please email me at impromptu.pianist@gmail.com. I'm looking to purchase this in the first or second week of January, 2016 after I move into the new apartment. First let me say thank you for great reviews, they gave me a starting point in looking for a new piano. It's people like you that make purchasing a more balanced experienced. I had a favorite music store at clavis.nl and told me they sold yamaha digital piano, Yamaha Portable piano P 115 - Digital because they were the best for beginner. I was bought it for my 8 year old. Again, many thanks for your review. It was such a big help for me. What about Roland F-140R, would that be a bad choice? I've owned a F-120 before, I believe, and I liked that piano. What is your opinion about which one is better, Casio PX 760 or Casio ES 110. In my country those two digital pianos have aproximately same price. I will buy one of those for my 6 years kid. The main requirements that needed are, hammer weighted action and sound close to accoustic piano. 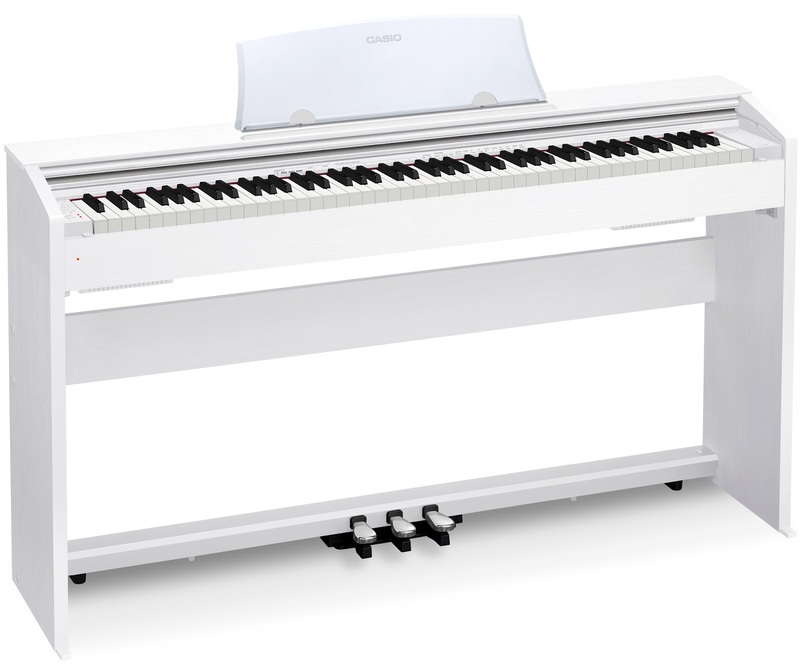 The secondary requirements are, more keyboard like features (tones, output connectivity), less weight so can be played at school stage. I'm looking to buy a new digital piano for my daughters... I'ved narrowed down the models between the Casio PX-760 or the Yamaha P-115. They are currently available for the same price where I am (in Canada.) I know one is a console and one is a portable, but in terms of sound quality and key feel, would you recommend one over the other? Both are on your recommended lists. Thanks in advance! Could you please tell me which one of ES110 and PX860 have a better action? Which one do you recommend in general?